Elies Kalamon (mostly known as Kalamata olives abroad), is a supreme variety of edible olives which are cultivated mainly in the Messinia (Kalamata) and Lakonia (Sparta) districts and in the wide area of Agrinion as well. The olive fruit is collected when it ripens from mid November till mid January. After the processing procedure (carving, salt solution, vinegar) we get the carved Kalamon olives in vinegar-salt, which is a product with designation of origin. Mid October till mid January is the time when kalamon olives are harvested and collected to make olive oil and olives cured in brine. Early in October they are green but as they ripen on the tree they become darker and darker until they become black. These olives came from my in-laws who have a lot of olive groves in Sparta and instructions how to make them were given to me by my sister-in-law. Wash the olives and remove any bruised olives. Then score them on one side. Place them in big jars with brine solution to cover them. Make sure that the olives are covered by the brine and leave them brine for at least two months. However in order to speed up the procedure, cover them with water, which change daily. After ten to fifteen days try one olive and if it is not bitter proceed to the next step, otherwise continue changing the water for a few more days. If following the first method, after the waiting period, wash them well and drain. Add the vinegar which leave it for two days. Do not strain them but place them in clean jars distributing the vinegar and add olive oil on top until they are covered, in order to avoid oxidation. The brine is of the right consistency if when putting a washed raw whole egg in the brine it will float. Remove the egg and mix in the vinegar. For the second method, after the 10 – 15 days water curing, make the brine solution. Prepare the brine and mix in some vinegar. For 1 litre brine add 350 ml vinegar. Put the olives in jars, cover them with the brine and vinegar solution and add olive oil on top. Let them marinate for a couple of days and they are ready to be consumed. No refrigeration is, of course, necessary. Thank you for sharing this preserving method. One of these days I’ll go to Greece in November to partake in the olive harvest. Ok, I invite you to come and we’ll go to Sparta. Don’t have to pay for gym after that. Wow, Ivy! I have never even SEEN an unpreserved olive before. Not living in a climate for olive trees it is impossible. That must seem so strange to you, huh? But Greece is number 1 on my list of places to travel, so I look forward to seeing them someday. Thanks Sunita for passing by. Jenn, Greece is wonderful for holidays and I hope that you’ll make it soon and I shall be glad to meet both of you one day. Just stumbled across this one, Ivy, and I’m really happy to have found it. I’m hoping this year I get enough olives to do some kalamata-style ones, but I didn’t know how before. Mama always does green olives. So anyway, thanks! I love the green olives (tsakistes) as well. I haven’t made them for some time now. Thanks for reminding me to make some. Hi there – am seeking a recipe that is a sort of dip/sauce for oven fries that I had in a greek restaurant. 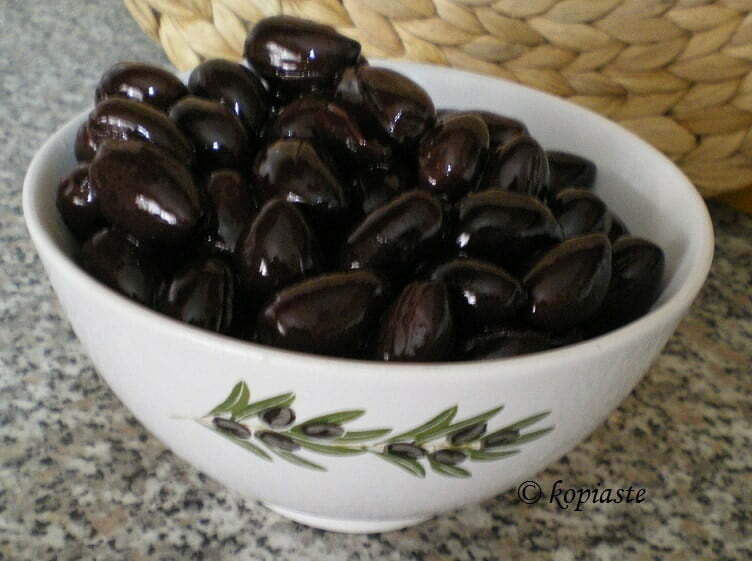 Basic ingredients that were given: kalamata olives and garlic. This had the consistency of a ranch type dressing but was oh so delicious. Have searched so many sites but finding nothing like that. Can any of you help? ?